Green tea has some important benefits when it comes to cancer, and also with other chronic illnesses. Green tea has a large number of research studies behind it supporting claims that it can prevent cancer. And increasingly there is a growing volume of research showing it can help fight cancer too. Studies show it can reduce the spread of cancer; and it also seems to have benefits specifically against leukaemia, prostate cancer, breast cancer and others. The compound EGCG, epigallocatechin gallate, a highly active polyphenol, is at the centre of this. For example, it has been shown to boost the immune system and it has epigenetic (cancer-correcting) benefits. EGCG is only about 70 per cent of the total catchetin content though. EGCG is sometimes referred to as epigallocatechin-3-gallate. 2. The Mayo Clinic have taken earlier studies and findings into Clinical Trials with Green Tea and chronic lymphocytic leukaemia, (CLL). (Journal of Clinical Oncology). Using Polyphenon E (derived from EGCG) at a dosage of 400-2000 mgs per day for 2 months, Phase I Clinical Trials showed that high doses helped decrease the white cell counts by one third in CLL patients, causing cancer regression. Those people with enlarged lymph nodes showed a 50 per cent reduction. 4. Other studies have shown that EGCG actually gets in to the prostate gland and make the cancer cells grow more slowly. It also reduces PSA levels and IGF-1 levels (1). 6. In breast cancer, EGCG has been shown able to prevent breast cancer, and to prevent breast cancer recurrence by suppressing growth of the cancer (3). 7. In 2012, epigeneticist Dr. Young S. Kim, working for the National Cancer Institute, concluded that EGCG was one of a number of polyphenol compounds that could prevent a stem cell cancer re-growing (like curcumin, piperine, resveratrol), and she stated that if you could not consume the food, you should use a quality supplement. 8. EGCG is a powerful polyphenol, and forms a strong combination with curcumin, piperine (in black pepper), resveratrol and pomegranate. The multi-compound POMI-T has full Clinical Trials behind it with prostate cancer where it reduces PSA scores significantly. Studies with breast cancer are current. And here to find Organic Green Tea supplement. Really, its hard to know where to start. Perhaps, given the myriad of claims for green tea, with a small note of caution. Much of the early research on Green Tea used Epidemiology studies. It is true that the people of South East Asia, Japan and China drink green tea and develop less cancers. But their environments at home are less toxic, their meat consumption less, garlic, vegetable and fruit consumption higher, stress less etc. And when they come to live in the West, even the green tea drinkers can develop cancer. However, research has moved on, with active ingredients identified and isolated, and even Clinical Trials showing clear benefits, not just for prevention, but in terms of stopping growth and spread of cancer. There is no doubt in my mind that green tea affords a real plus in the fight against cancer. It will surprise most people to know that both green tea and the black stuff weve been drinking in the UK for several hundred years come from the same plant, Camelia Sinensis, found in tropical and sub-tropical regions like India and China. Black tea when dried is fermented and oxidised. Green tea is left unfermented, and then merely steamed. Many experts now believe that green tea is thus a better, more whole, source of natural chemicals like proteins, sugars and vitamins and, in particular, natural antioxidants. Legend has it that green tea was "discovered" by Emperor Shea Nung in 2737 BC in China, by accident when some wild tea leaves ended up in the water he was boiling. Around AD 800 Buddhist monks took the drink to Japan, where the tea drinking ceremony (the cha-no-yo) evolved. By the 16th century tea was heading West as explorers visited Asia. The active ingredients vary considerably depending upon where the tea was grown. Young leaves and buds are the usual parts used. Green tea contains caffeine and thus has a mild stimulating effect. But the greatest benefits are due to a group of flavenoids called polyphenols, which the lack of processing in green tea leaves unaltered whilst the drying process concentrates. Polyphenols are potent antioxidants and have been shown to protect against heart disease, as they can prevent the formation of LDL, so called "bad" cholesterol. By preventing this oxidation, the polyphenols prevent plaque building and fatty deposits forming on the walls of the arteries, as well as lowering cholesterol and triglyceride levels overall (Cedars-Sinai Medical Centre), whilst increasing "good" HDL cholesterol (Saitama Cancer Centre Research Institute, Japan). These effects are particularly noticeable when consumption exceeds 10 cups per day. Researchers from the University of Pennsylvania and Boston Biomedical Research Institute have shown that EGCG helps protect the brain from the build up of amyloid proteins (Nat Chem Biol Dec 2009). They concluded that Green Tea would help prevent Parkinsons and Alzheimer’s, and could also be used in treatment. Other 2009 research on Green Tea (Journal of American Coillege of Nutrition, 2009) showed that it could prevent colds and flu. The study compared people taking a green tea supplement with those taking a placebo and showed one third ;less colds and flu in the green tea supplement group. Research has shown that, because EGCG is anti-inflammatory, it has benefits with arthritis, and rheumatoid arthritis(4). Japanese research with 82,000 adults between the ages of 45 and 74 showed that drinking green tea could reduce the risk of stroke(5). Green tea is also claimed to improve skin tone, smooth out wrinkles and even to help you slim. Some of the polyphenols, called catechins are known to be up to five times more potent as antioxidants than Vitamin E. They are important in maintaining metabolic pathways and can stop the uptake of glucose by fat cells. Green tea and catechins can also reduce appetite according to research in the International Journal of Obesity. A balancing effect on blood sugar levels may also be of significance in diabetes, and the limiting effect on glucose uptake, the reduction in appetite and the stimulation of energy production in cells due to caffeine levels all can result in weight loss (University of Geneva, November 1999 - American Journal of Clinical Nutrition). In the latter study, researchers found that men who were given a combination of caffeine and green tea extract burned more calories than those given only caffeine or a placebo. The polyphenol, epigallocatechin gallate (EGCG), seems the most active and the most potent. Early studies used it topically in the prevention of UV-induced skin cancer, while other studies (Nature 1997, Jankun) have shown that it can inhibit the spread of cancer. Research from Perth University in 2002 showed drinking just one cup per day reduced ovarian cancer risk by 60 per cent, and in 2003 the same group showed it reduced prostate cancer risk by 33 per cent. By 2009, they had turned their attentions to breast cancer and showed that Green Tea could reduce breast cancer rates by 40 per cent. And if women ate mushrooms daily as well as drinking green tea, only 1 in ten of them would get breast cancer compared to those who consumed neither! Green teas active ingredients are also thought to be anti-oestrogenic. Research from the Shanghai Cancer Institute looked at oesophageal cancer among those who neither drank alcohol nor smoked (two of the main causes). 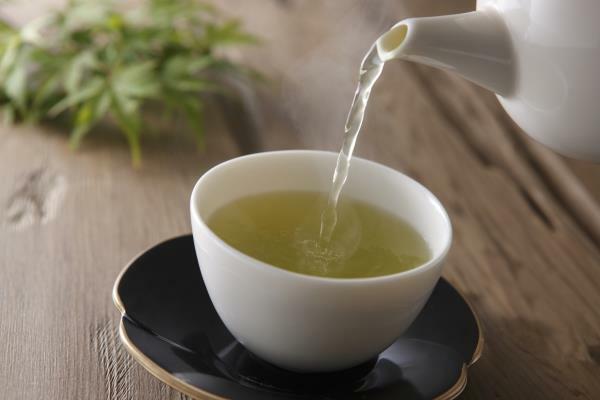 They found drinking green tea further and significantly reduced risk, starting at 57 per cent in the no alcohol group and 60 per cent amongst the non-smokers. Overall the more green tea drank, the better the results. (Journal of the NCI). EGCG has been found to block an enzyme, ornithine decarboxylase, which tells cells to multiply at cancer cell rates. By blocking this enzyme, cell death occurs. EGCG is also known to cause good bacteria in the intestine to flourish, thus aiding your first line of defence. But perhaps the research of most significance was reported in icon in July/August 2004. The prestigious Mayo Clinic in the USA researched green tea with leukaemia patients and concluded that "4-7 cups per day stops leukaemia in its tracks". I’m not sure whether it does or not but I think if I had leukaemia, I’d try it! Other studies have suggested that green tea has a positive effect in breast cancer, liver cancer and colon cancer prevention, and there is also work showing it improves the positive effects and reduces the negative effects with people undergoing radiotherapy and chemotherapy. Intake should probably be around two to three cups per day, although some experts recommend ten. It does contain relatively high levels of caffeine and you may prefer to drink decaffeinated versions. The bitter taste can be offset in other blends, for example green tea with jasmine or with the powerful antioxidant lemongrass, or by sweetening with honey. The Japanese in particular have a whole range of soft drinks based on green tea but these do have quite high sugar content. One downside of green tea is that it can cause discolouration of the teeth, turning them yellow or even green. One cup of green tea can contain as much as 130 mg of polyphenols. But how you store it, how you brew it, the source and age of the tea are all factors in this. Green tea is also available in supplement form and the recommended dose is about 300 mgs once per day. Finally, white tea is now growing fast in the popularity stakes, being made totally from the unopened tea buds. It has even more polyphenols than green. White tea gets its name from the white hairs on the buds but it makes a golden coloured tea. Laboratory studies suggest a positive effect with colon polyps (UCLA). Are there any side-effects to green tea? Green tea has been drunk for 5000 years without ill effects. But there are side effects, the most obvious being from the caffeine content, like tremors and sleeplessness at high levels of consumption. Other side effects like diarrhoea and stomach irritation have been reported. The main objection to green tea is its taste. Once you overcome that dry, blotting paper effect, the real question is, "why not?". It clearly does have significant health benefits across the spectrum of chronic illnesses and a good antioxidant content, and should be a part of your natural antioxidant repertoire. If you have a cancer, it would seem a sensible step to move on to Green Tea from your coffee or normal cuppa. Especially as we covered German research in Cancer Watch in 2008/9 which showed that the antioxidant benefits in normal tea were completely negated by adding cows milk! What are you waiting for? Drink 5 cups a day - or, if you have to, supplement! If you want to buy green tea in supplement form and are unsure of what supplement to buy, click here to purchase the Natural Selection ’Product of Choice’. Finally, research from Perth University shows that drinking green tea AND eating medicinal mushrooms can cut the risk of breast cancer by a whopping 90 per cent. Please be clear: At CANCERactive we do not consider the above compound to be a cure for cancer, despite what the research says or experts doing the research may claim. The above, is an article on the compound from published research and expert opinion in the public domain. At CANCERactive we do not believe that any single compound (drug, vitamin, whatever) is a cure for cancer. We believe that people can significantly increase their personal odds of survival by building an Integrated Programme of treatments. Equally, cancer prevention is best practiced through a width of measures.